As the Federal Aviation Administration prepares to issue a long-awaited rulemaking regarding the identification and tracking of unmanned aerial system or UAS devices, typically called drones, the agency is changing up its leadership ranks. On Nov. 29, the FAA promoted Earl Lawrence to executive director for aircraft certification, succeeding Dorenda Baker, who retired on Nov. 30. Lawrence, formerly the head of the agency’s UAS integration office, will be replaced by Jay Merkle, deputy vice president for the FAA air traffic organization’s program management office. The FAA noted that its UAS integration office coordinates the development of regulations, policies, programs, and procedures to enable the safe integration of UAS into the National Airspace System. Both of those appointments are effective Dec. 9, the agency said in a statement, and both executives will report to Ali Bahrami, the FAA’s associate administrator for aviation safety. Also on Nov. 29, USDOT Secretary Elaine Chao appointed Wayne Monteith to be the FAA’s associate administrator for commercial space transportation; an appointment effective Jan. 20, 2019. Monteith, a recently-retired U.S. Air Force Brigadier General who previously served as the Commander of the 45th Space Wing at Patrick Air Force Base in Florida, will provide executive leadership and oversight of the office of commercial space transportation and to “encourage, facilitate, and promote U.S. commercial space transportation,” the FAA said in a statement. Those moves come ahead of long-term effort by the agency to craft drone identification and tracking regulations. The FAA chartered the UAS Identification and Tracking Aviation Rulemaking Committee nearly three years ago to provide recommendations to the agency regarding technologies available for remote identification and tracking of drones – recommendations the committee summed up in a 213-page report issued in late 2017. Since then, the agency has been “fast tracking” the development of drone identification/tracking rules, with the FAA’s Lawrence testifying before the Senate Subcommittee on Aviation Operations, Safety, and Security in May that development of the remote ID requirement for drone aircraft is “vital” to greatly expanding the use of larger and heavier UAS craft, and the safe integration of drones into the U.S. national airspace. “It will be difficult for the United States to establish global drone craft technology and market leadership unless a remote ID requirement is put in place,” he said in his testimony, noting that “everything hinges on that,” because all aircraft, including drones, need to identify themselves. 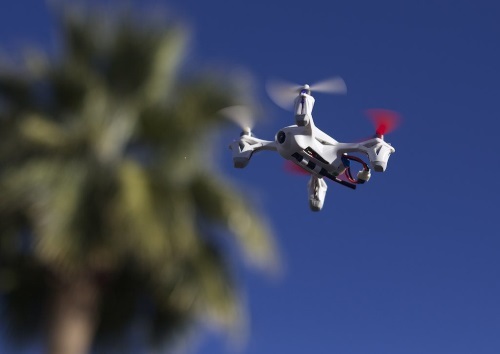 Currently, according to the Defense Daily Network, the FAA is preparing to issue a Notice of Proposed Rulemaking or NPRM this spring focused on remote identification of drones operating around airports and the national airspace.